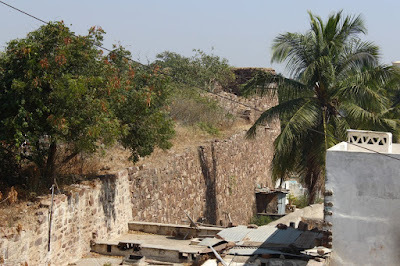 On the first day of my tour of Bijapur, Gulbarga and Yadgit districts Talikoti and Muddebihal forts were on my list however I skipped the latter because it was slightly out of the way. We were driving back from Dharwad to Hyderabad. 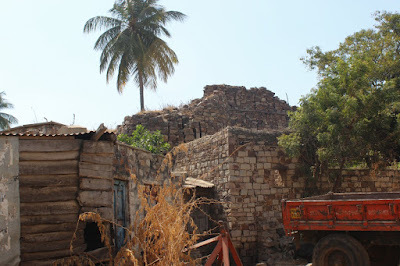 My plan was to visit Bijapur, probably spend the night there and then continue the journey. Just as we approached Bagalkot, plans changed and we headed towards Kudala Sangama where we spent couple hours and then continued towards Bijapur. 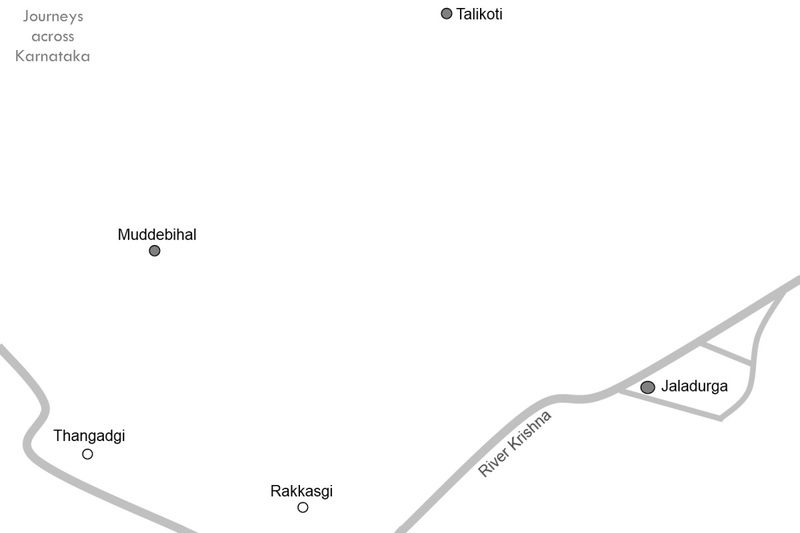 At Nidagundi I saw a board pointing direction towards Muddebihal. So our plan changed again.. I decided to visit Muddebihal to check out the fort ruins. Muddebihal is taluqa headquarters town. 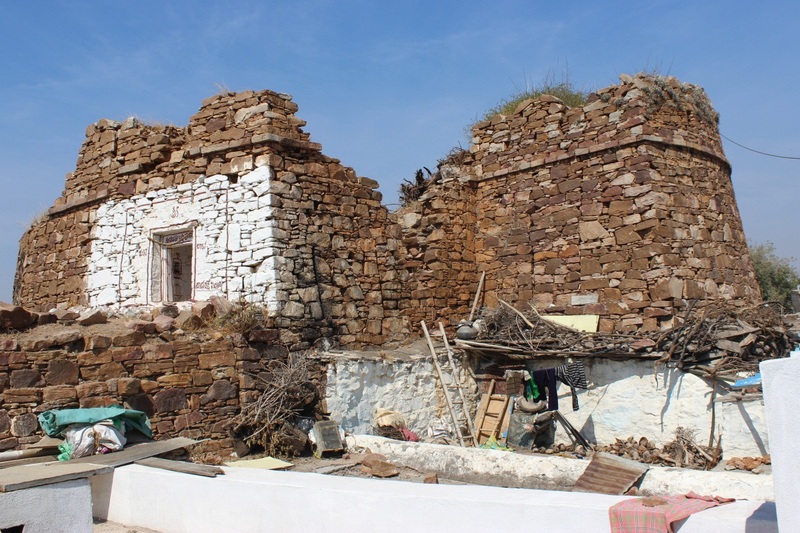 The town has grown out of the fort itself.. in fact the localities in and around the fort are tightly packed with a network of narrow streets. Driving a four-wheeler through the narrow gullies wasn't easy. Here's a snap-shot of from Wikimapia screen, within the black circle is Muddebihal fort ruins. 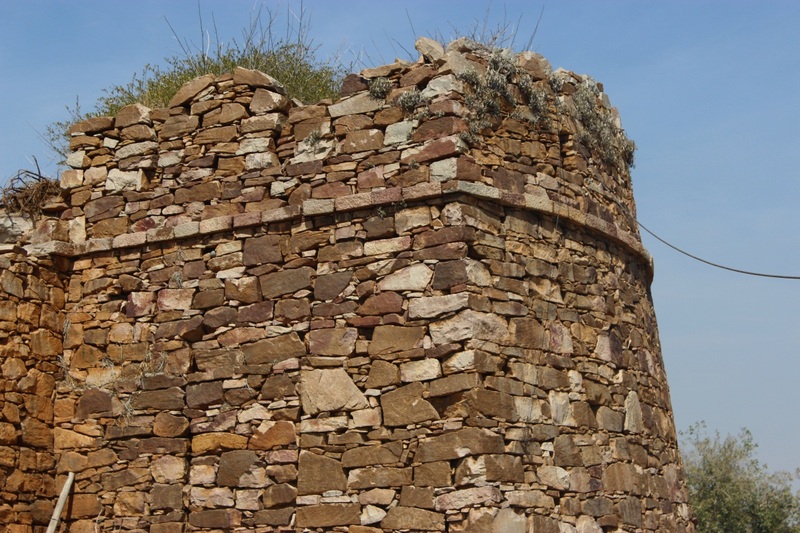 There are seven bastions and some rampart walls surviving. Probably there were seven or eight more bastions i.e. 15 bastions originally. 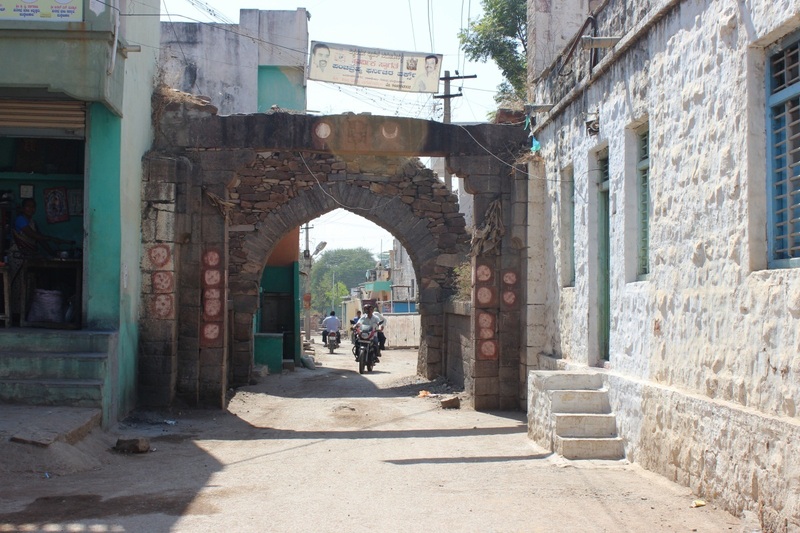 This is one of the surviving gateways into the fort area. We went through it, barely 100 meters in the street got too narrow for a car. We turned back.. Close to this gateway is an ancient shrine under a Neem tree. I left my car near the largest bastion, Pushpa chose to remain in the car rather then roam the filthy streets under the blazing Sun. A local volunteered to take me to the bastion. There's hardly any space between houses, ruins, gutters and what not :( No chance of taking a picture of the whole bastion. 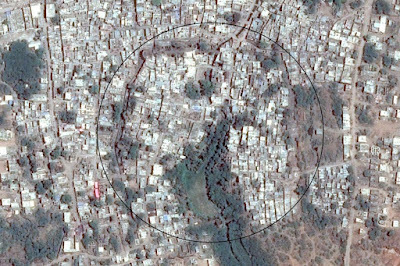 In this photo, under the open space is a wide gutter.. on the left is the fort area and on the right are recently built structures. The fort area is completely encroached, even some portions of rampart walls. My guide spoke to one of the house owners who let me go to the terrace to take pictures. On the bastion top is a Hindu shrine. The bastion is well built.. Portion of surviving rampart walls. There's no information online about Muddebihal's history. With its proximity to Talikoti fort, Muddebihal fort might have been used as a garrison during great battle between the five Muslim armies and VIjayanagara army. The battle which brought the downfall of Vijayanagara is said to be fought in the plains between Talikoti, Rakkasgi and Tangadgi. 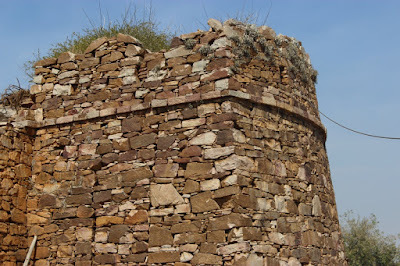 Also close by is the island hill fort Jaladurga. The island sits in river Krishna's path, creating two streams which flow around the hill and merge into each other. 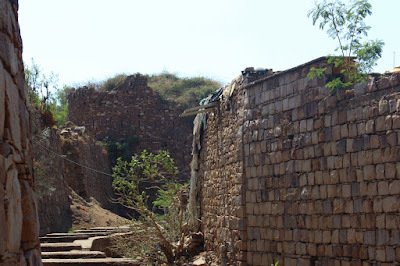 From Muddebihal we head towards Bijapur.. Thank you, Noorul Mubin Nadaf. @aNiL - no, never heard of it. thanks for the info, will check it out.